Perfectly portioned, these 8 gram packets of savory soy sauce will deliver just the right amount of distinctive flavor to your customers' food. Such packets as these are ideal for any restaurant, diner, convenience store, cafeteria, or take-out station and offer a quick and easy way to enhance profitable menu items. Made of a fermented soybean paste, the light, smooth consistency of this traditional soy sauce can be served as a delicious dipping sauce, or cooked into meat and poultry for a more enhanced flavor and tender taste. This soy sauce is cheap but it have no flavor to it. It just taste like water with dark color on it. Not good for any food. Thank you for the review Guo. We’re sorry this has not worked well for you. For an alternative that might better meet your needs, try this Kikkoman Soy Sauce 6 mL Packet - 500/Case instead! Bought this for my sister to make her boyfriend weekly meals in to go containers. A case of 450 should last for over 2 years. Good taste ! This Kary Out company makes some great products, we started using the Spicy mustard then tried this soy sauce, it's so cheap and delicious. wish they made other condiments. Perfect for my food tuck. My customers like to use this on their rice bowls. The packets were delivered safely without any busted open. I'll be buying these again. I love cooking my vegetables with Kari Soy Sauce because I don't need to use a lot of it when stir- frying them. I grew up with this brand and it became a standard to have it in our home. Just toss in a little with of it and some sesame oil to make whatever food we cook taste really flavorful. The price is a steal too! The products delivered, soy sauce packets, arrived as described in perfect, pristine condition. It was well packaged and the quality is good. It was a good buy. The best thing about this is that it isn't too salty. It is great tasting and is easy to disperse in proportioned packaging. The price is excellent on Webstaurant as well. I would recommend this. The soy sauce is really tasty and makes a really good sauce for our fried rice and vegetables. The portion packets are the perfect way to send in to go order bags. Low price. Much more economical than the wholesale store where I can afford to buy. ideal for easy distribution among customers. I recommend this product for its rich flavor and quality I have used it for more than 10 years and I will continue using it. So much cheaper than buying it at our local restaurant wholesale shop. Great quality, yummy taste and super affordable! Highly recommend this product-- we've been using it for 3 years! Thanks Webstaurant.com! THESE ARE WELL PACKAGED AND SEALED. WILL RECOMMEND ORDERING THESE. THESE PRICES YOU CANT BEAT! JUST BE CAREFUL WITH YOU OPEN. DONT USE ANYTHING SHARP. IT WILL CUT THROUGH THE LITTLE PACKETS. These packets are good taste and such a great value. Good on top of many asian dishes like fried rice, lo mein, stir frys and for dipping sushi as well. The perfect little serving size of soy sauce, great for packed lunches or when you need just a little splash of flavor. I love this brand packaging with the cute panda. This is a great case price! A great tasting soy sauce that is perfect for single serving use. The soy is great on rice and has the perfect amount of salt. A great price as well. Very conveniently packaged in individual pack is very helpful for food service. It is no mess and clean. This comes in handy specially for take out. Great taste and at an incredible prices. Trust me we searched around and these prices can't be beat. Convenient when your on the go and in a rush. Soy sauce! 8 gram portion packets that came in a box with 450 in the case. There are many uses for these but we all know they are great with your Chinese lunch or dinner! A very good tasting soy sauce that is perfect for our condiment bar at our sushi bar. The soy is perfect in taste and a great price. Pretty good flavor but not as strong as leading brands. We had several customers comment that the sauce was "weak" compared to the soy sauce they had used previously. Overall not completely disappointed. But will not purchase again. Thank you for your feedback! We are sorry you did not prefer these soy sauce packets. For recommendations, please contact our Customer Solutions team! The perfect portion packet of soy sauce that is great for taking on the go. I love the great taste and has just the right amount of soy for a single serving. Unbelievable taste at a price that can't be beat. If you are trying to save money but not the taste, this is great product to do it on. 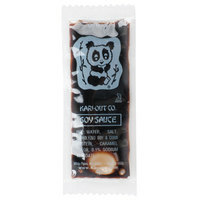 Very good soy sauce in nice conveinent packets that are great for take out orders. The packets are strong and have just the right amount of sou sauce for your meal. Great price, good flavor and fast shipping allows us to keep up with inventory for our food truck and cafe with take out sauces in inventory. These packages are nicely packed. My fist two orders were good, but the second time order these, some of them spilled all over the others. But reasonably priced. These are great to give out and carry for use. They are ultra convenient, easy, tasty, and perfectly portioned, and adds to easy clean up. This is a great deal. My rep charges me triple for the same product. This purchase is a no-brainer when you're looking to lower your food cost. These soy sauce packets will work for most tasters, but a little saltier tasting than Kikkoman, and not as full flavored. These balance better with chinese food, but if you're looking for a soy sauce to compliment japanese food like sushi, I'd go with Kikkoman. It's nice to have portion size pouches of soy sauce for packing in lunches. They hold up well and don't leak. To me, they are more watery then what I get in a bottle, so I use a little more. For the price they are still worth having on hand. A very good soy sauce. I was a little hesitant because it was a different brand but has great quality and taste. The size is the perfect about for a teriyaki bowl. These packets of soy sauce are great. Not only are they quite flavourful, but they are inexpensive for the amount that you get. They are great for take-out orders especially. These packets are a great price that is excellent in controlling our costs. Very flavorful and easy to handle multiple orders at once with a simple handful for each bag. Pretty tasty soy sauce that contains no MSG. Being able to get it in these small packages allows us to control how much of this to use. Great soy sauce in convenient pouches. Great for packing lunches doesn't take up a lot of room and no risk of small containers getting tossed in the trash. This soy sauce is not only priced right at a value you can only find here but delivers every-time. This is the same packets you find the Chinese restaurants giving you. Great for portion control. amazingly low price. i havent seen a price this low ever before. very fast shipping and excellent quality customer service. amazing. Perfect packets!! Great price that is excellent in controlling costs! The taste is great! Very flavorful! Great size that is just right for your favorite dish! This soy sauce portion pack is the way to go for controlling the cost. The price on this website is extremely cheap for this great product. I definitely kept on shopping here and recommend all friends and family. Came in great condition! NO packets were leaking at ALL, which I have had problems with other brands in foil packets. I love the panda logo, very convenient for my customers to choose the right amount of soy sauce to take with their meal! easy for take away and all my customers love it-- come in a small,but just right portion.. easy for inventory control and easy for customers to curry away.